At Comic-Con I did get some photos taken of my superhero Bellossom, I guess I should call her super-Bellossom or something. All photos are from Tom Larsson, or at least his camera. The costume consists of one green longsleeved dance leotard. This is a good proof that you get what you pay for. I first bought a really cheap one from ebay, and it had a strange green colour and everything about it was cheap and low quality. I then bought this version from an actual dancewear shop, and it was so good. It's really tight, but holds everything in place while still being comfortable. I actually wore it under my Mon Mothma most of the weekend to make it easy to switch between costumes. Thanks to this leotard this is probably one of my most comfortable costumes. I did wear a pair of green tights under it all as well, since the skirt turned out a lot shortern than I had planned at first. The skirt and gloves are made from lycra. The skirt turned out so short because when I made it I happened to get a stain on it at around knee level, so I cut it shorter, but didn't first realise just how much shorter I had cut it. A good thing with lycra is that it doesn't fray so I didn't have to he anything. The gloves as you can see had a tendency to slide down on the arms though. The cape and belt are also made from lycra. The belt was a really ugly leather belt, pink and embossed with flowers, that I found at an op shop and simply covered with the lycra. I kept the buckle, but it's in the back so you can't see it because of the cape. The cape is just lightly handstitched to the leotard at the front. The boots are a pair of red gogo-boots, and I think I'm going to make a separate post about them. I had originally planned to use my hairflowers that I made for the the other Bellossom costume, but they were too big and heavy. These ones are made from transparent worbla, with a small piece of yellow lycra as the centre. They are attached with magnets to a headband that I'm wearing under the wig. The throw-flower is also made from transparent worbla. The shield is a plastic viking shild I found at a toystore and repainted. I couldn't get it quite as smooth and shiny as I wanted, so instead I made sure to give it a lot of battle damage. Finally the eyemask is made of fosshape and held on by an elastic under the wig. Me and Tom as the dynamic pokémon duo of Captain Carp and Bellossom-girl. 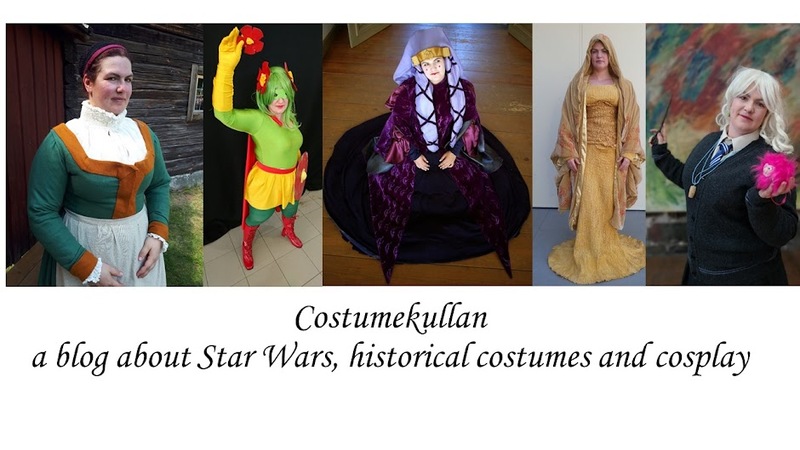 And finally some of the people from Cosplay Dalarna that were at Comic Con Stockholm.